This page was recently amalgamated from material from propagation constant, phase velocity and characteristic impedance pages. The generalized lumped-element model of a transmission line can be used to calculate characteristic impedance, phase velocity, and both parts of the propagation constant (phase and attenuation). The model uses an infinitesimally small section of a transmission line with four elements as shown below. Here the series resistance, series inductance, shunt conductance and shunt capacitance are all normalized per unit length (denoted by the "prime" notation). By the way, the transmission line model graphic can be downloaded in a Word document along with lots of other microwave schematic symbols, just visit our download page. Note that the phase constant is proportional to frequency. 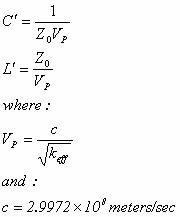 It also turns out that the expression SQRT(L'C') is the reciprocal of phase velocity of the transmission line. Here's a separate page on that topic! But for now, remember that it is always less than or equal to the speed of light in a vacuum, which is "approximately"2.99792458E+08 meters per second. What does low-loss mean here? Let's assume that the ratios in the above relations are held to 10%. We made a calculation for PTFE coax, 50 ohms, at 10 GHz. At the conditions described, R'=1500 ohms/meter, and G'=0.6 Siemens/meter. Both would result in losses of 130 dB/meter (or 0.13 dB/mm). This is a very lossy cable by lab standards. Although this is slightly oranges/apples comparison the condition is even lossier than what you might measure on a MMIC transmission line at X-band. Note that the condition scales with frequency, W-band signals can have ten times as much loss and still meet the condition. So the approximation holds for just about any transmission line, no worries! Now on to the propagation constant equation. Approximations are made using the first two terms of a Taylor series expansion. We refer you to Pozar's excellent book if you want to study this. Here's the separated phase and attenuation constants. Note that the phase constant is calculated exactly the same from way from capacitance and inductance per unit length, regardless if the transmission line is lossy or not. The term alpha1 is actually the metal loss in a transmission line due to the skin depth effect. The term alpha2 can be further separated into loss due to dielectric loss tangent, and loss due to substrate conductivity. We have a separate page on transmission lines loss that deals further with the topic of splitting up the attenuation constant, check it out! phase velocity can mean something very different when we discuss waveguide. For a TEM transmission line (coax, stripline) with air dielectric the velocity of light reduces to the constant "c" which is the velocity of light in a vacuum (2.997E8 maters/second). What are L' and C' to the lay person? L' is the tendency of a transmission line to oppose a change in current, while C' is the tendency of a transmission line to oppose a change in voltage. Characteristic impedance is a measure of the balance between the two. How do we calculate L' and C'? that depends on what the transmission line is. For example our page on coax give the coax equations. For coax and stripline 50 ohm transmission lines that employ PTFE dielectric (or any dielectric material with dielectric constant=2), the inductance per foot of is approximately 70 nH, and the capacitance per foot is about 30 pF.